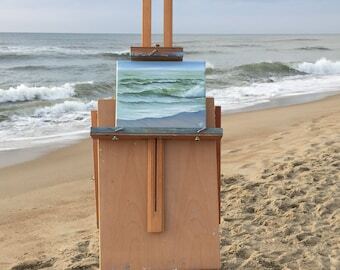 Small ocean waves study "Tides of Hope" painted on location: Fort Lauderdale, Florida, oil on deep back stapled canvas 12x4 inches. •	Ready to hang, framing is not required, edges painted, varnished, wired, signed and dated by me. •	This original artwork is accompanied by a Certificate of Authenticity. • I use all professional packing materials to make sure your artwork gets to you safely wherever in the world you may live. 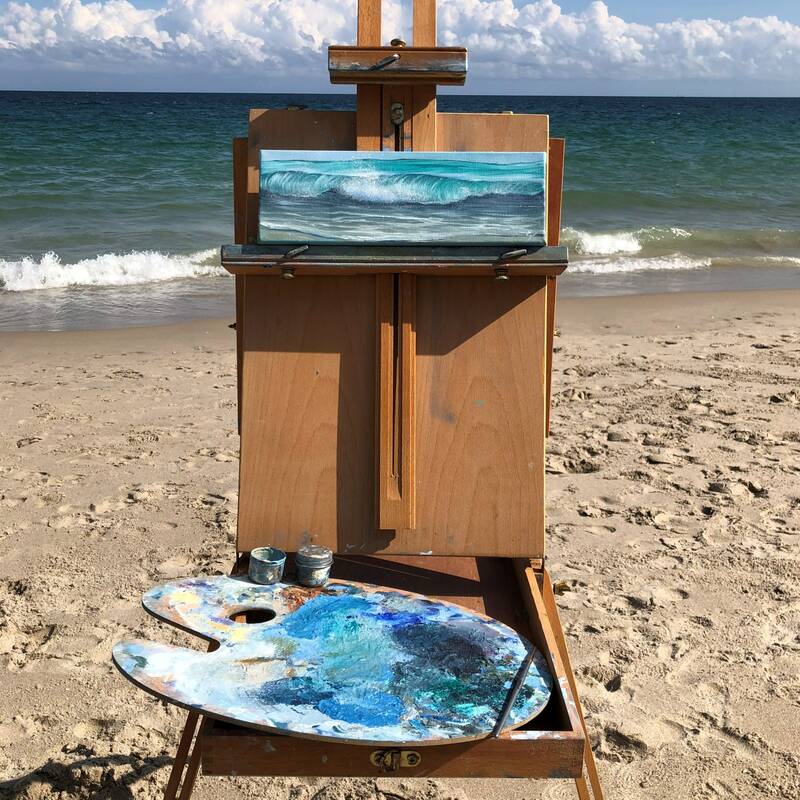 •	All seascapes are hand-painted by me, Eva Volf, using professional grade oil paints and 100% cotton archival quality canvases so you will have your original oil painting for a lifetime to enjoy. 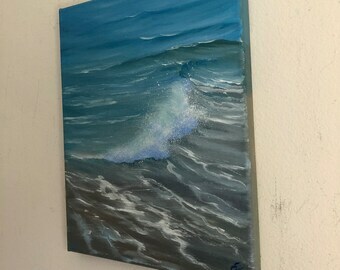 This is the 6th painting that i’ve Purchased from Eva Volf, one of which was a custom order. I love my newest addition “Moon Ritual”. It looks great! I feel like the ocean is always near. I will buy another although my husband says “no more art”. Lovely addition to my home! 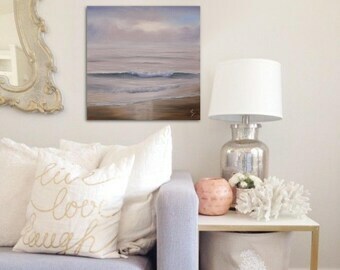 Extra Large Cloudy Sunrise Painting 60x12"
Beautiful painting. Selling was lovely to work with and even went above and beyond to work with me when I had a concern regarding my custom order. Highly recommend!! What kind of materials do you use for your artworks? 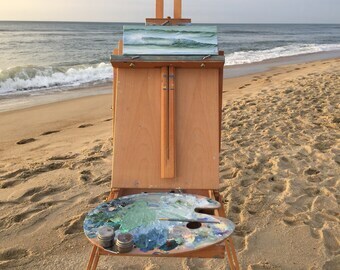 Every one of a kind oil painting will come to you on high quality gallery canvas or traditional quality back stapled canvas for small oil paintings. 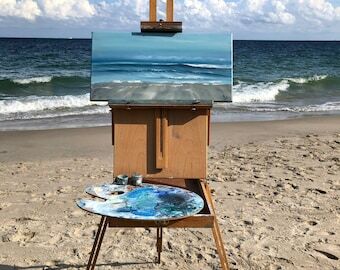 My customers and long term collectors who receive a true original piece from me know that my artworks are made in the USA from professional grade oil paints down to the well made canvas. All artworks come with a personally signed certificate of authenticity, dated, sides painted, wired and ready to hang on your wall. I use all professional packing materials to make sure your artwork gets to you safely wherever in the world you may live. Do you offer custom and personalized work? I will be happy to create custom art, just for you. Please convo me and we can brainstorm ideas for the perfect artwork. No problem. Please contact me. 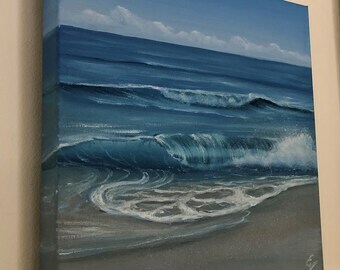 I can paint all artworks in your own size and color preferences. Also I can print any image at your own size, just let me know. Shipping times vary depending on the destination. It takes from 1 to 3 working days to prepare for shipping: I pack the item carefully into wrapping paper, secure the edges and corners with cardboard/foam, then use bubble wrap, foam board and bubbles, then put it into cardboard box. All the items shipped with tracking information, so they can be easily tracked through their way to you. Yes, it is. I will send you a tracking number which will enable you to track your package. Once shipped, you will receive an email with your tracking details and expected delivery date. - I am pleased to ship to most International locations including Canada, UK, Europe, Asia and Australia. - USA: USPS Priority Mail (Insured, tracking included). - UK, Europe, Asia, Australia: USPS/UPS/FedEx (Insured, tracking included). - please don't forget to include a reachable phone # in message box when checking out, it is required for the international shipping labels. - the international buyer is responsible for any additional customs duty charges, if applicable. My artworks are professionally packed and insured. I also understand that accidents happen so if you receive a damaged painting you must save the damaged box, take its photo (before you open it) as well as the photo of the damaged artwork, and send me the photos, so I can file a claim with the shipping company. They will need to see the box and painting to launch their investigation.